You can DOUBLE the working life of your Custom Parking Signs by adding 3M Protective Overlay Film (POF)! 3M’s high-tech POF protects sign faces against fading caused by the sun and harsh weather—and makes graffiti and sticker defacement damage easy to clear away without harsh abrasives. Every parking space in your parking lot makes a big and often under-appreciated contribution to your company’s success. Yes, parking lots make money. If you do not have parking spaces set aside for your customers, they will soon become someone else’s customer. Custom parking signs are a cost-effective way to manage your parking areas and improve customer loyalty. If you could only know how many times a potential customer said, "I don't want to shop there. They never have parking." Your customers will appreciate having parking reserved for them. And an attractive custom parking sign with your company name and logo, and maybe a short personal welcome, is a great way to improve your company’s branding and name recognition. First impressions last. So why not start impressing your customers and potential shoppers right in your parking lot? 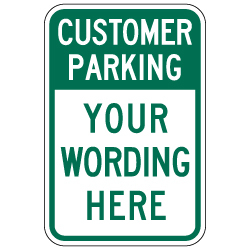 A custom parking sign helps to keep your customers satisfied and wanting to come back. And it also deters non-customers from risking being ticketed for taking up your parking. Why? Because a custom parking sign tells them your parking area is being monitored, maintained, and enforced. Amortized over the long life (7-15 years) that a custom parking sign will be working for you, it's a small investment that pays long-lasting dividends.